Once favorite shoes starts to leak, wear and requires immediate repair. Is it possible to seal the sole or it is necessary to immediately turn to a professional Shoe shop? There are short-term and long-term measures that will help your shoes be useful some time. To make them yourself, you decide. To repair the sole with strong glue for rubber is the most usual method to bring the shoes in order. Usually this is a temporary measure. If the front edge of the sole comes off a bit ("ask cereal"), clean the bonding surface from dirt and after drying, treat them with acetone. Usually at home used super-glue "Moment". Well established in the practice of self-repair soles epoxy adhesive (EDR), the sealant is "Crazy handles" polyurethane tool Desmocoll". Use the glue according to the instructions on the package. It is usually applied in a thick layer (2-3 mm), incubated for 10 minutes and heavily compress the shoes weight from night to morning. Ideally it will do in the Shoe repair shop with a special press. In the same conditions as domestic use the means at hand, trying not to deform the shoes. Is to use the "g"-shaped pad with extra weight. If leaky sole has a honeycomb design, when worn it formed void – heel fails, the shoes at this point becomes thinner. Lift the insole and thoroughly clean the honeycomb from contamination, glue residue and torn cardboard. Then you can fill them with sealant (MS polymer) and give as follows to dry. Cut out the shape of the old insole cardboard templates, saturate them with the same tool and stick on the sole, then install the new insoles. Sometimes cell sole flows because of the small puncture. In this case, also disconnect the insole (if it is in order, it can only be done at the site of puncture). Pour honey comb silicone sealant, fill them with scraps of porous rubber (micropore), and again apply the silicone. Put the insole and press it strongly until the repaired sole dries out. To fix the solescracked across at home is almost impossible. To do this, refer to the cobblers and make rubber label ("prevention"). The same should be taken when wearing the heels and toe. If you managed to get a thin rubber sole on the size of your shoes, try to stick it on their own. Use a sturdy Shoe glue. The rubber part stuck to the basis of polyurethane or nylon, first weld the hot iron on it just cut a lining from cotton canvas. 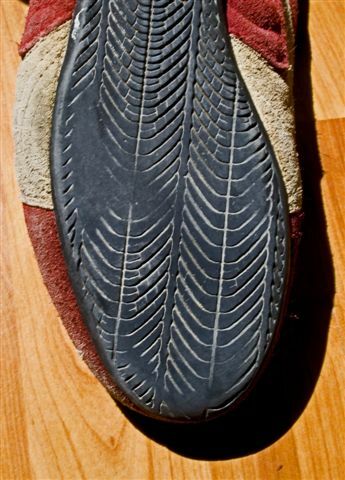 When gluing rubber soles on the skin, it is recommended to do a 45-degree edge. However, it is more reliable to repair the fracture or abrasion of shoes can only skilled craftsmen. If you are planning for a long time to wear shoes, just take it to a shop and ask them to do the polyurethane stickers. Then you will not have to think about how to seal the sole. Such prevention is inexpensive and easily replaceable. Winter stickers will save you from ice. This time of year crude methods of Shoe repair - only a short-term measure, as frost boots and shoes quickly fail.